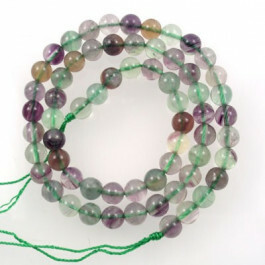 Fluorite Stone Round 6mm (66pce Strand) - 40 cm /16'" Strand. The ancient Egyptians used fluorite in statues and in carving scarabs. Artifacts of carved fluorite were found in the ruins of Pompeii. The Chinese have used it in carvings for more than 300 years. The name fluorite comes from the Latin fluo ("flow") in reference to its use as a flux. Another interesting aspect is its fluorescence in ultraviolet light and the word "fluorescent" is derived from fluorite. It is purported to help the evolution of harmonious, peaceful and organized spiritual growth. It has been said to help clear the mind and heighten mental achievement while increasing the ability to concentrate.